Puppies are ready and willing to potty train. If they had tails, they’d wag them with excitement over getting to use the potty on their very own. They seek to please, and they want to understand and learn the rules. As their partner and coach, it's up to you to teach them these rules. To help you learn how to speak to your Puppy about the potty, we've put together some simple potty scripts. I’m going to the potty. Want to keep me company? I notice you’re holding your privates. Maybe you need to go try the potty? I just heard you make a toot! That means a poop might be getting ready to come out. Let’s see if you can make one. You drank a whole big cup of water at breakfast. I bet it might be time to try to make a tinkle. Wanna try? Let’s go to the park. But first, everyone has to go to the potty. As soon as everyone has gone, we can head on out! Is the poop hurting today as it comes out? That means you’re a little constipated. Hold my hand It’s important you try to get it out anyway. It’s gonna feel SO GOOD when it finally comes out. Then, let’s pick a really healthy snack so next time, it will be all soft and squishy and won’t hurt at all! The doctor told me your poops should be about the size of a medium banana each day. Let’s look at yours. Do you think you got out all the poop? Maybe there’s still some left. Keep trying! (When resistant): OK! NO MORE POTTIES TODAY! 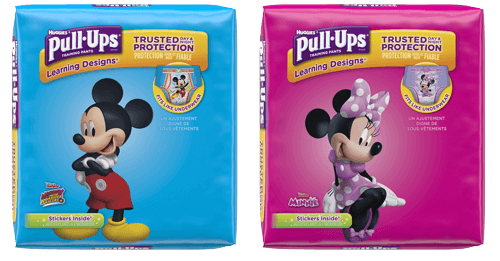 Today you can poop in your Pull-Ups® if you want to. It’s up to you! Would you like to put the potty away or leave it out here for when you’re ready to try again? [At school]: I heard you used the potty today! That’s great. Do you want to show me how you did it? Let’s go try the potty one more time before we read our story and tuck in for the night. Good work! Do you want to show Daddy/Mommy before we flush it? Would you like privacy or company? You may want to explore the scripts of other potty personalities, too, to see what works best with your own child.